This 39 year old female patient was diagnosed with HIV infection during pregnancy in 2007 and received sdNVP at the time of delivery. She had a CD4 cell count <200cells/ul in January 2008 but did not start antiretroviral therapy. She initiated TDF/3TC/EFV in September 2010. Adherence to clinic visits has been good according to her file: she attended on time for each clinic visit. She knows the names and dosages of her antiretrovirals. She has disclosed her HIV status and ART use to family members. Counselling has not revealed any specific barriers to adherence. Further history reveals a diagnosis of epilepsy (for which she has been taking phenobarbitol 30mg nocte for 20 years) and asthma (for which she receives budesonide and salbutamol inhalers). The patient had suboptimal viral suppression at six months after ART initiation and has remained viraemic at 12 months. There was some immunological response with increase of CD4+ cell count from 96cells/ul at baseline to 171cells/ul at six months.  Resistance genotype: It seems as if she has been failing for a short time and has thus accumulated only NNRTI resistance and the M184V mutation without any other NRTI mutations. AZT and TDF are therefore still viable options. Treatment recommendation: Since the virus is still susceptible to TDF, the patient should do well on a standard second line consisting of TDF/3TC/LPV/r. However, given the high VL, an alternative regimen consisting of AZT/3TC/LPV/r would be more sensible in light of its higher barrier to adherence, provided the patient has a Hb>10 g/dl and does not have a high risk for metabolic complications. Adherence: Intensive adherence support is needed and the use of alternative remedies and social deterrents to adherence should be thoroughly explored. General comments: This patient has a high risk of IRIS in light of her high VL. She should be closely monitored for the development of IRIS during the first 6 months of treatment. If started on TDF, her renal function should be monitored before initiation and again at three months. If the patient has a high risk of renal disease, pre-existing renal compromise (especially HT and DM patients) or is taking any nephrotoxic drugs such as NSAIDs, ACE-inhibitor, streptomycin, monitoring can be done more frequently. I. Give two reasons why this patient might have had developed antiretroviral resistance? II. Would you make any other changes to her medication? Ia. Single dose nevirapine for prevention of mother-to-child transmission (PMTCT) is known to give rise to NNRTI-resistance mutations. 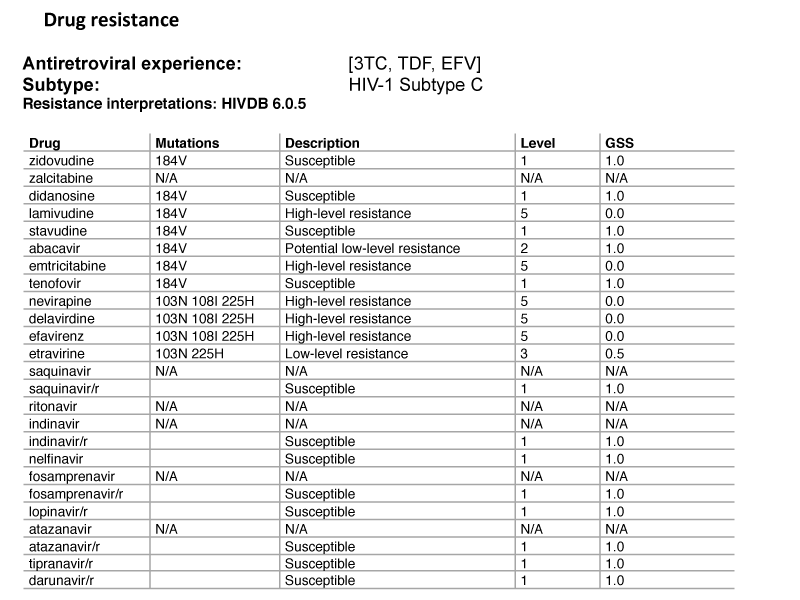 Resistant strains can be archived during untreated HIV infection and, when ART is subsequently commenced, these drug-resistant strains are rapidly selected. The response to NNRTI-based ART has been shown to be inferior amongst women exposed to sdNVP. Ib. Phenobarbitone can interact with efavirenz through the cytochrome P450 system. This could potentially lead to reduced serum efavirenz levels thus compromising viral suppression. Many of the older anticonvulsants (phenobarbitone, phenytoin, and carbamazepine) have potential interactions with the NNRTIs and should ideally not be used in patients receiving ART. II. The phenobarbitone should be replaced by an alternative anticonvulsant, for example sodium valproate. Other newer anticonvulsants (lamotrigine, gabapentin, leviteracetam) also have less potential for interaction and can be used if available. Care should be taken to avoid adverse consequences of barbiturate withdrawal.